NOTE - Quilting effect evident in the ice cream shape. NOTE - plain interior Marie. NOTE - Abscence of quilting effect in ruffled shape. NOTE - Usual rayed interior Marie. 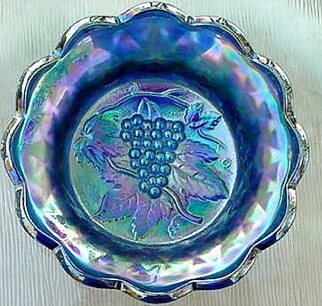 HEAVY GRAPE Bowls in 7”- 8”: are found in marigold, purple, emerald, helios, smoke, green…..and rarely in blue-lending to a cobalt shade. When Steve Fink sent these two photos of his IC shape in blue, along with questions about the lack of a rayed marie (collar base), we were able to make some comparisons which we decided would make a “healthy update” on what may have become misconception surrounding a “variant” in this pattern. Let's say that, if by “honest mistake”, an apprentice picked up an un-patterned mold-base section from the mold shop, and it fit the appropriate opening, as the mold pieces were secured into place, some few examples of such as Steve's bowl were cast. 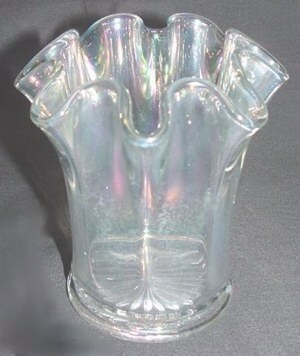 Then an appraisal was made by a more experienced glassworker, and the intended rayed collar base was exchanged for the one having no design, correcting the error. Rather than having created a “variant”, we believe this could be better described as “whimsey”, or a temporary error. Further, let us sum up the absence of “quilting” (in some instances) in this design, along with flaring the outer edge of a bowl into a more flat configuration (plate shape with edges turned up slightly). In performing this task, rationale dictates that some of the design characteristics should be lost in the process! Does this constitute a twelve-sided HEAVY GRAPE VARIANT Plate? We think not. It merely was a desperate attempt on the part of that glass shaper with his apple-wood paddle, to salvage a piece which otherwise would have been lost to overheating. 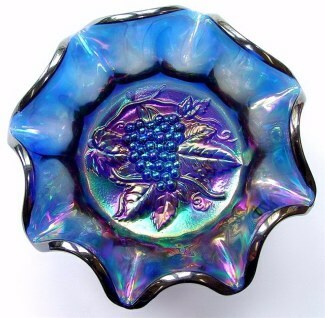 How many blue Heavy Grape bowls are known? Perhaps 8? Steve Fink and we have taken a more focused view of the interior plungers used for these bowls. We have discovered use of two different molds. Steve’s example not only has a plain marie, but counts 29 grapes in the cluster; whereas ours has 37 grapes. There is also a slight variation in shape and placement of the leaves. So, which came first in production? If the other owners of these blue Heavy Grape bowls will please make an assessment of their situation, we will have a better scope for consideration. Thank you in advance for any input you can provide. 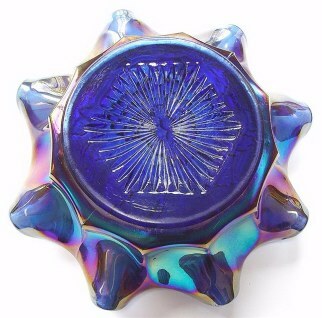 Steve Fink has found an amethyst eight inch plate with the same plain base as the couple of blue bowls, which he is responsible for locating, as well. The face of Steve Fink's plate having the plain marie. HEAVY GRAPE 11 in. 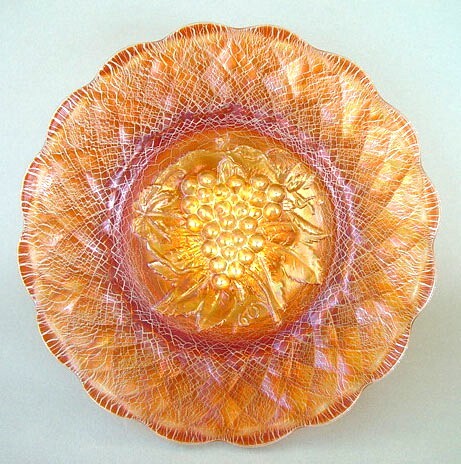 Chop Plate in marigold with stretch effect. 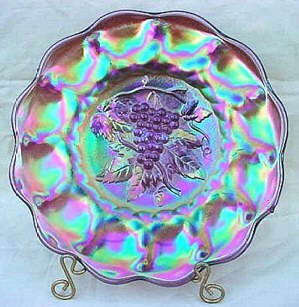 HEAVY GRAPE Chop Plate - 11”-12” found in marigold, purple, emerald, helios, amber, smoke, white, ice green, and green. 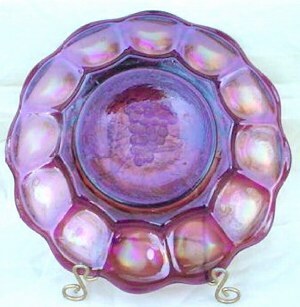 As compared to the numbers of bowls in berry set sizes of 5-6” and 9-10”, along with those in 7-8” size, few of these large plates find their way onto the carnival glass scene, we hasten to add. The striking difference in an ordinary, or “usual” marigold chop plate and the one we illustrate here, is the stretch effect, which lends great interest. We recall during the early `80s, when a California teenager named Rusty Shupert, who is no longer a collector, found the first of the smoke chop plates in this pattern having this same stretch effect, and quickly brought out the “envious” streak in prominent collector, Don Moore! Lots of fun was had over THAT! Whether a buyer designated a preference for this “effect” when placing an order, or whether these were created as an attempt on the part of Imperial to include these pieces with “stretch glass elements” to extend their market, we do not know. The largest assemblage of these chop plates in our memory was in the collection of the late Marge and Chuck Kremer of Indiana. What a lovely sight to behold! 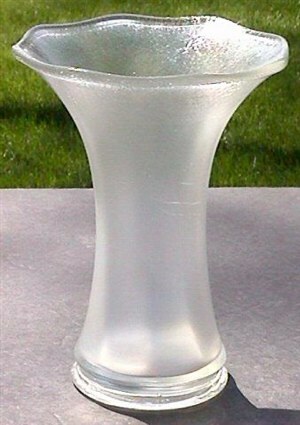 7 1/4 inch SMOOTH PANELS, which would be viewed as Stretch Glass, sold over Ebay in May 2004. SMOOTH PANELS : A rose bowl shape in marigold and clambroth is seen frequently. Vases from 5” to 12” in height are known in marigold, purple, clambroth, smoke, marigold on milk, teal, red, smoke on milk glass……………and in “white stretch”. In addition to the one shown here, which sold at a carnival glass auction; during the summer of 2004, a flurry of these short, white-clear? vase-types shown in our photo, appeared on Ebay, with some “hefty prices” realized. 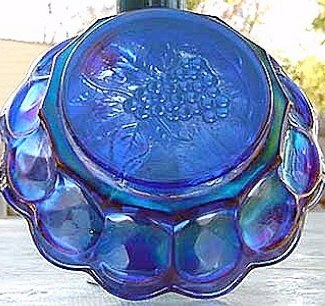 What new collectors must understand: Over the past 100 years, as original manufacturers have ceased to operate, molds have scattered not only to producers of reproductions in the USA, but to many foreign manufacturers, who are not regulated by health laws preventing use of toxic oversprays (as used in iridizing.) Skepticism is not misplaced, nor a “bad thing” in many cases! These letters appear on a Smoke ACANTHUS 9 1/2 inch Plate. INITIALS Appear on a Smoke ACANTHUS Plate? : We have handled this plate. The letters are there-in the mold! This plate sold at a prominent auction in 2004. In coming home, we checked our smoke Acanthus and found it lacking in such identifying marks?? Do these initials indicate a “newer mold”? This is presented for your consideration. We each must draw certain conclusions when assessing such pieces for purchase. 9 inch Clambroth OPTIC & BUTTONS Plate with the Iron Cross Mark. OPTIC & BUTTONS 8.5 in. Round Two-Handled Bowl. 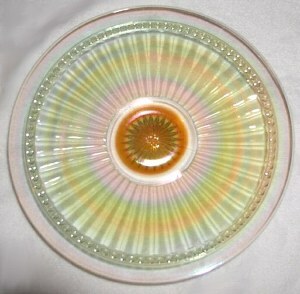 OPTIC and BUTTONS: Carnival production of this pattern was more limited than the 28 different shapes noted in an old Imperial Catalog listing non-iridized crystal examples. Of the 14 or 15 carnival shapes known, possibly the most rare is the tiny Open Salt, two-handled, 5” in marigold. Range of colors found in Optic and Buttons is quite limited. 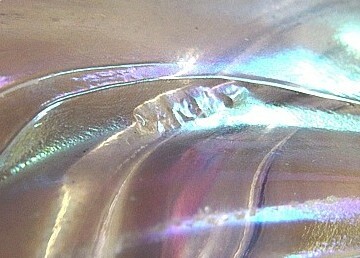 A soft pastel clambroth is found in some of the shapes, along with some examples found in smoke. Beautiful marigold is a standard with Imperial patterns. The 9” clambroth plate we picture here, might possibly be the under-plate for the two-piece salad set? No specific size is given for that plate. Records only refer to a 6” and and 7 ½” plate. If any of you happen to have the two piece salad set, perhaps you will be kind enough to measure that plate and clear this up for us? 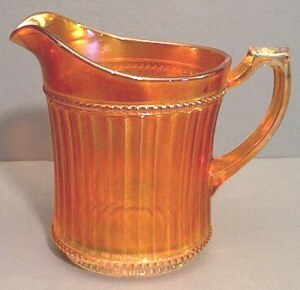 Recent appearance of the creamer, now lends credence to the possibility of a complete table set in marigold! Other known shapes found in carnival glass, other than those we have mentioned or show photos of: cup/saucer, rose bowl, stemmed compote, stemmed goblet, tumbler, and two round bowls, 5” and 8”. In addition to being the longest chapter of the Bible, Psalm 119 forms the very heart of the Scriptures. 176 verses, and calls us to recognize its worth by living it out.